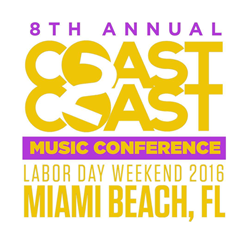 Coast 2 Coast Music Conference is proud to announce the A&R Manager for Def jam Records, Polo, Atlantic Records Director of A&R, Yaasiel "Success" Davis, and Sire Records/Warner Bros. Music Group A&R, Eric McLellan, as guest panelists for the upcoming 2016 Convention Labor Day Weekend in Miami Beach, FL. Coast 2 Coast brings together independent artists to network and speak with many tastemakers in the industry, and none more influential than the A&R. At Def Jam, Polo is responsible for bringing new artists and projects to the label, as well as manage and facilitate current projects from Def Jam’s catalog. As an A&R Polo is always looking for the next star to bring to the label, and has been influential in projects from artists such as Jay-z to Rick Ross. Polo will be judging the Main Event Artist Showcase as well as speaking on panels throughout the weekend. Last year in 2015 Success spoke on panels as well as judged the Coast 2 Coast Main Event Artist Showcase & Finale Showcase, where he scouted over 40 artists to choose the winners alongside his peers. In 2016, Coast 2 Coast is proud to have Mr. Davis as one of their prestigious panelists for the panel discussion, as well as an esteemed judge for the Main Event Artist Showcase. Success will be attending all days of the conference and accessible for all attendees to meet! Eric McLellan is an A&R based in NYC for Sire Records and Warner Bros. Music Group, and has worked with artists such as Deniro Farrar to get his deal with Vice Records. Eric will be speaking on a few panels throughout the weekend and is looking forward to working with new artists! Coast 2 Coast Music Convention has partnered with Miami LIVE, the all new live music venue in Miami Beach to host various events during the weekend long music conference. The venue will be set up as a performance venue and also as a workshop for guest speakers and artists looking to network together. Check out Miami Live at http://www.miamilivevenue.com.